This 1 bedroom villa with swimming pool is located in Roccastrada and sleeps 4 people. It has WiFi and barbeque facilities. The villa is near a beach. Terraced house, 2 - 4 people, 2 room/s, 1 bedroom/s, 1 bathroom/s, approximately 42 m², 1 floor/s, separate access to the property. Feature: Property on a manor (5 building(s) in total, 6 units in total). Gas for heating according to consumption approximately € 5/​cubic meter. Linen/towels available. Change of bed linen/towels, € 10 per person. Deposit € 150 (in cash). Extra bed € 7 per day (on order). Cot/​High chair free of charge (on order). Either an extra bed or a cot can be ordered. Pet 2 animals allowed (please advise prior to arrival). Situation: rural, view of Montepescali. 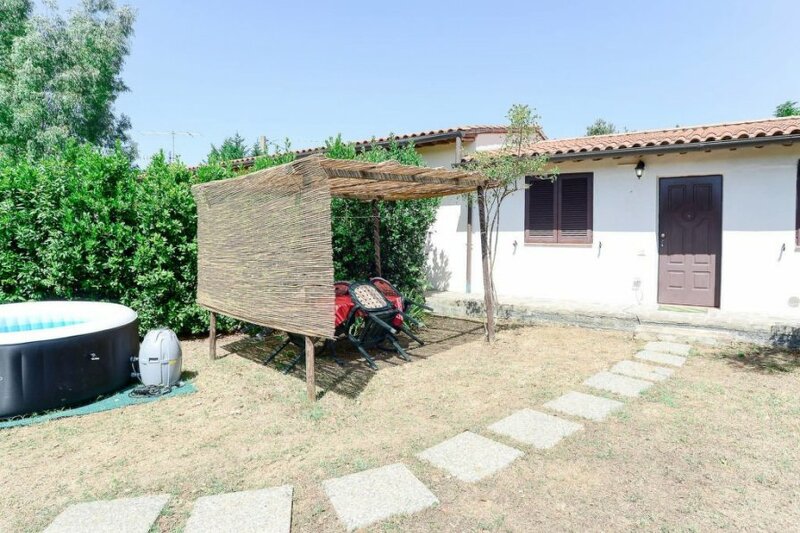 Estate (shared use with the owner and holiday guests): approximately 8 ha, partially self-contained (fence, entrance gate), trees, with plants, grapevines, olive trees. Private use (free of charge): outdoor whirlpool. Infrastructure: Sale of own produce (olive oil, wine, marmelade, fruit, vegetables); breakfast, dinner with the owner: payment and request on-site. Plot description: reserved open space (pergola, with bast top), furnishing provided, transportable barbecue. The villa is described as good value for money. It has a swimming pool and is located in Roccastrada. The nearest airport is 190km away. It is set in a convenient location, just 0 metres away from a beach and 7km away from the city center. The villa has free wireless internet. The property has a sauna; it also has a BBQ. The villa is suitable for family friendly summer holidays.